Another round in the Great Zucchini Conundrum of 2017… I remembered back to the late 1980’s, when my mom made a very popular Chocolate Zucchini Cake. She is at home recovering from rotator cuff surgery, so I gave her a call. It took her a bit to dig up the recipe, but she did! Mom’s recipe was actually for a sheet cake. I modified it a bit, using a 9 x 13 cake pan. That makes it a bit taller, a bit more tender, and a bit less icing-dependent. So the flavor is more cake, less icing. And a fairly outstanding cake at that! 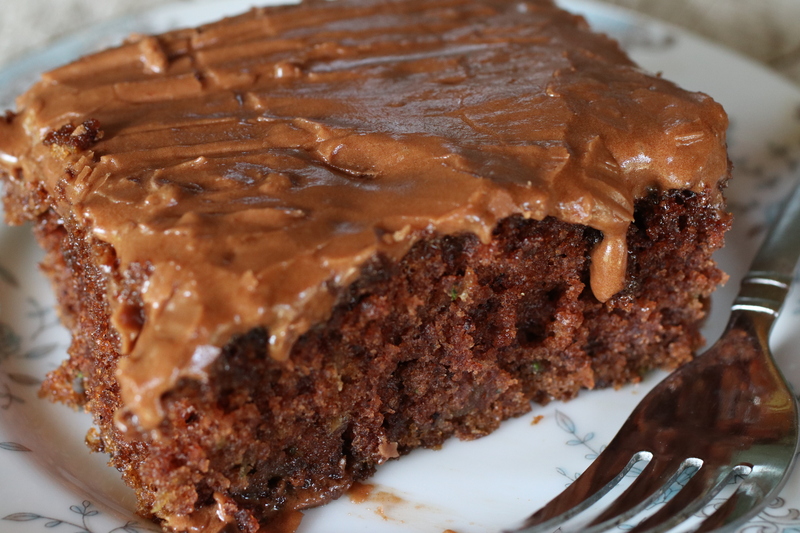 Tender, moist, chocolaty, with just enough zucchini flavor to make you think it might have a bit of health benefit… I also scaled back on the sugar a bit. I mean, in the 1980’s I still drank fizzy sugar water drinks, so maybe it didn’t seem too sweet then, but now is a different story. This is still plenty sweet and dessert-worthy! Preheat the oven to 325 and grease a 9 x 13 baking pan. In a mixer bowl, cream together the sugar and oil. Add the eggs and vanilla extract, and beat well. Fold in the zucchini. Sift the flour, cocoa powder, baking soda, baking powder, and salt together into a separate bowl. In alternating thirds, add the dry ingredients and milk to the zucchini mixture, just until well combined. Don't overmix! Pour the batter into the baking pan, and bake for approximately 35 minutes, just until done. Check with a skewer or toothpick - if it comes out clean, it's done. Using a mixer on high speed, cream the butter and vanilla. With the mixer on low speed, add the cocoa powder, and then the powdered sugar slowly, until it starts to combine. Slowly add the evaporated milk, increasing the speed at the end. Beat into a frosty, well, frosting. When the cake is finished baking, allow to cool for approximately 10 minutes before icing. Icing a warm cake is odd, but be gentle. Some of the icing will melt and absorb into the top of the cake. Watch this one carefully as it bakes. I haven't made it enough times to narrow down the baking time very accurately. I had to make a few adjustments according to what I had on hand — I used liquid coconut oil, a half / half mix of milk and buttermilk, I slightly rounded the Tb’s of cocoa powder, and I didn’t do any frosting. It’s fantastic. It was fantastic the same night, and it gets better every day.